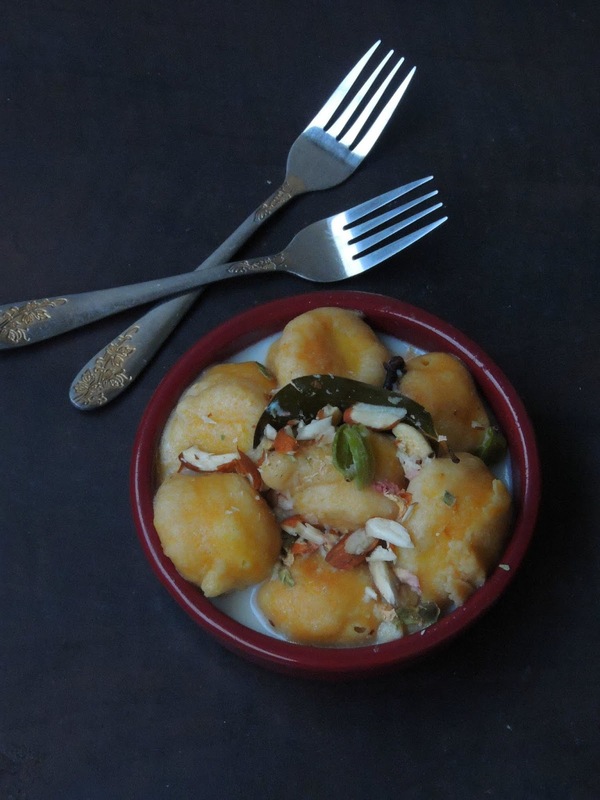 Coming to this month's theme, we cooked some delightful dishes from Manipur. Manipuri cuisine is totally different from other Indian states cuisine. Manipur is one of the states in North Eastern part of India. When my partner Prathima Shivraj of Prathu's food gave me milk and sugar as my secret ingredients, i immediately checked google to get a Manipuri dessert and hence i ended up with this Sweet dish. 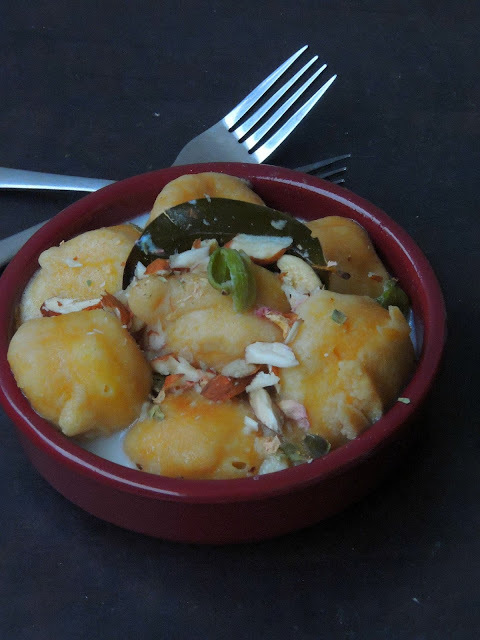 Madhurjan Thongba is a simple sweet dish prepared with gramflour dumplings which is deep fried and served with sweetened milk which is flavoured with cardamom and nuts. Quite an interesting dessert to make and enjoy without any fuss. Make a thick batter with gram flour,baking soda with enough water. Heat oil for frying, drop a spoon of gramflour batter and fry. Fry the dumplings in small batches, drain the excess of oil with paper towel. Meanwhile heat milk, sugar, with cinnamon stick, bayleaves, crushed cardamom until they get reduced a bit. Put off the stove, remove the sweetened milk from the fire. 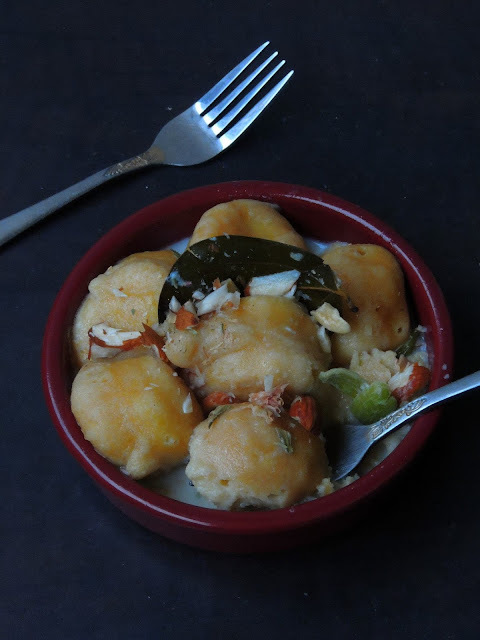 Drop the already prepared gramflour dumplings and let it sit for few minutes. Note: Some Madhurjan thongba calls for grated coconut, its completely optional. This looks interesting. 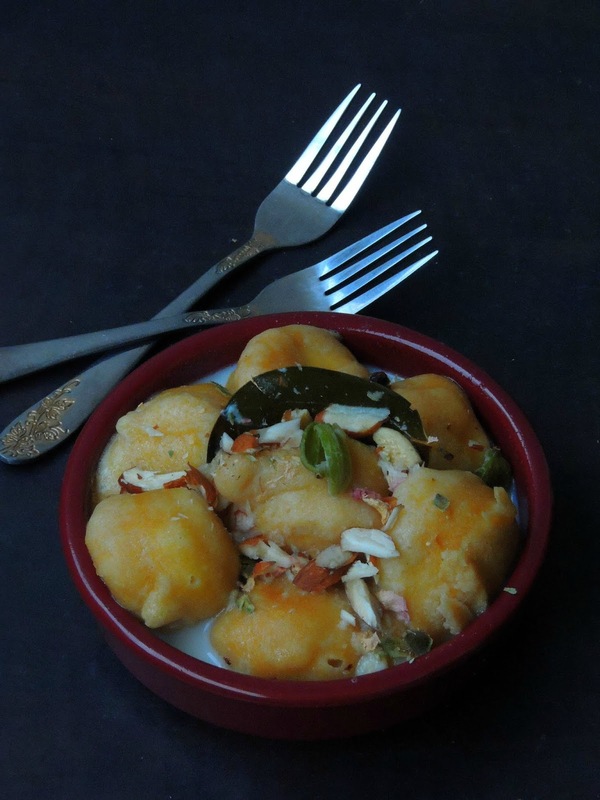 Kind of a sweet take on dahi-vada. I am definitely going to try this one :-) Thanks for exploring and sharing! Oh, my gosh! These Madhurjan look so delicious they take my breath away. :) I'd love to grab one straight off the screen! Wow what a beautiful name Madhurjan. Loved this different easy and simple recipe. Looks so inviting. I can imagine the taste and aroma. Lovely share. For me, every meal needs to end with a sweet touch, and this wonderful and unique dessert would be something I would so savour; especially on a weekend. Madhurjan! The name rolls around the tongue just as this delectable sweet looks like it will do when eaten. The recipe is fairly straightforward and would make for a different variety of sweet during festival time! Oh, these dumping look absolutely delicious and easy to prepare. You made them perfectly Priya. Loved the dessert and the uniqueness of the recipe. Dumplings dipped in flavoured milk sounds and looks delicious Priya. Discovering new dishes in unknown cuisines is always a delight.This new dessert definitely looks so tempting and its gluten free. A completely different dish, I read twice if the dumplings are made of gram flour. I am curious as how will it taste with milk. Interesting recipe. Madhurjan - this sounds so interesting. This sweet dish looks absolutely delicious and so decadent. This is an interesting dessert to try out Priya. Sweet dumplings in flavored milk sounds delicious ! Loved this so easy and simple recipe.